BeckerTime offers these watches in sizes 34mm and 36mm. 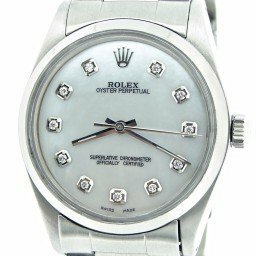 We offer a selection of Rolex Oyster Perpetual mens stainless steel pre owned watches with colorful dials and a variety of bezels and bands.  Each purchase comes with a 30-day money-back guarantee and a one year warranty on most watches. In addition, we offer personalized customer service. So, don’t hesitate to contact us for assistance. Also, we offer after-sales support and a Lifetime Trade-Up Guarantee on qualified items. This means you can come back to us when you want to upgrade to another model. Browse our collection for the timepiece that fits your style and budget. Clearly, wearing a pre-loved Rolex Oyster on your wrist puts you in distinctive company. As Rolex’s entry-level watch, the stainless steel Oyster Perpetual is the gateway to the brand’s vast selection of everyday watches. Today, we’re comparing two mens stainless steel Oyster Perpetual watches. These are two of the most current versions to compare their similarities and differences. 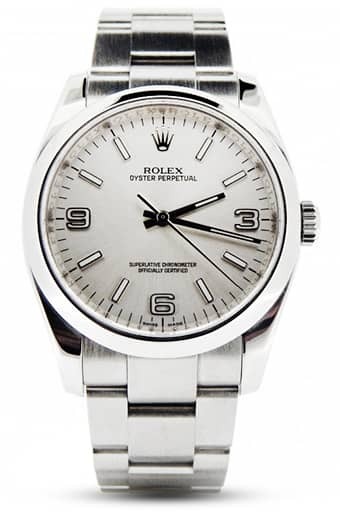 The two most current versions of the mens stainless steel Oyster Perpetual watches are the Oyster Perpetual 36 ref. 116000 and the Oyster Perpetual 39 ref. 114300. While the former reference has been around for about a decade, the latter, larger sized OP joined in 2015. The Oyster Perpetual ref. 116000 sports a 36mm stainless steel Oyster case and is available with an assortment of dial options. Early versions include more neutral shades like silver, blue, black, and white, in addition to funkier concentric dials combining black and orange, blue and silver, and other colors. Then in 2014, Rolex released a range of new colorful dials for the Oyster Perpetual 36 ref. 116000 including vibrant shades with names like red grape and white grape, along with more standard blue and steel color options. Two years ago, Rolex enriched the collection with the Oyster Perpetual 39 ref. 114300. 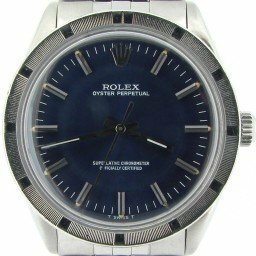 This time, this particular men’s stainless steel Oyster Perpetual watch incorporates a larger 39mm Oyster Case—perfect for those looking for a bigger basic Rolex watch. Dial options are limited to only three, but the dark rhodium, red grape, and blue colors are all great choices. Both the Oyster Perpetual 36 and Oyster Perpetual 39 include the matching steel Oyster bracelet fitted with the Oysterclasp. Also, to complete the straightforward and contemporary design approach, both of these men’s stainless steel Oyster Perpetual watches feature a smooth bezel to secure the sapphire crystal to the case. While both the Oyster Perpetual 36 ref 116000 and the Oyster Perpetual 39 ref 114300 are time-only models that run on Rolex automatic mechanical movements, they each have a different caliber under the hood. Driving the Oyster Perpetual 36 ref. 116000 is the Rolex Caliber 3130 self-winding movement—identical to the one powering the No-Date Submariner ref. 114060. In fact, the Rolex Cal. 3130 operates at 28,000 beats per hour, includes 31 jewels, and offers a power reserve of 48 hours. On the other hand, at the heart of the Oyster Perpetual 39 ref 114300 is the Rolex Cal 3132 self-winding movement. In addition to the same frequency, jewels, and power reserve of the Cal. 3130, the Caliber 3132 also has the added benefit of the Parachrom hairspring and Paraflex shock absorbers for better resistance to magnetism and daily knocks. Naturally, even though these are considered entry-level Rolex timepieces, both of these men’s stainless steel Oyster Perpetual watches are indeed COSC-certified as illustrated by the “Superlative Chronometer Officially Certified” designation on the dial. Which Men’s Stainless Steel Oyster Perpetual Model will it be? Aesthetically and functionally very similar, opting between the Oyster Perpetual 36 ref. 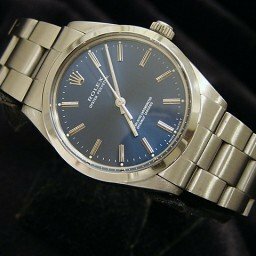 116000 and the Oyster Perpetual 39 ref. 114300 is really a matter of size preference. Both men’s stainless steel Oyster Perpetual models are fantastic everyday luxury watches. Beautifully understated, Rolex Oyster Perpetual timepieces are stunning examples of Rolex restraint.